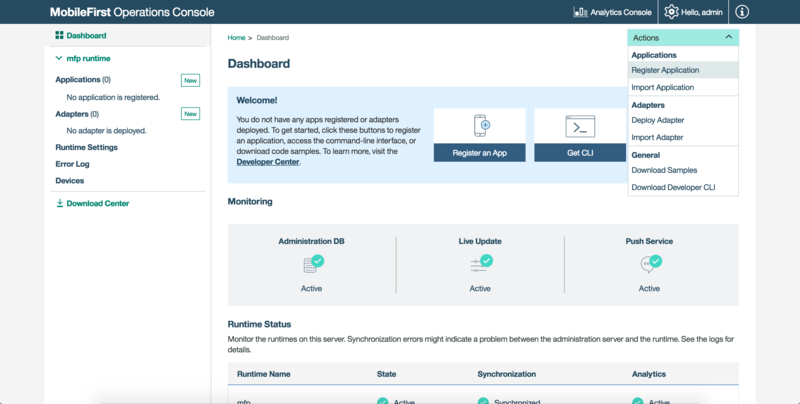 The IBM MobileFirst Operations Console is a web-based UI which enables simplified work flows for both the developer and the administrator to create, monitor, secure and administer applications & adapters. Develop applications for any environment and register them to MobileFirst Server. 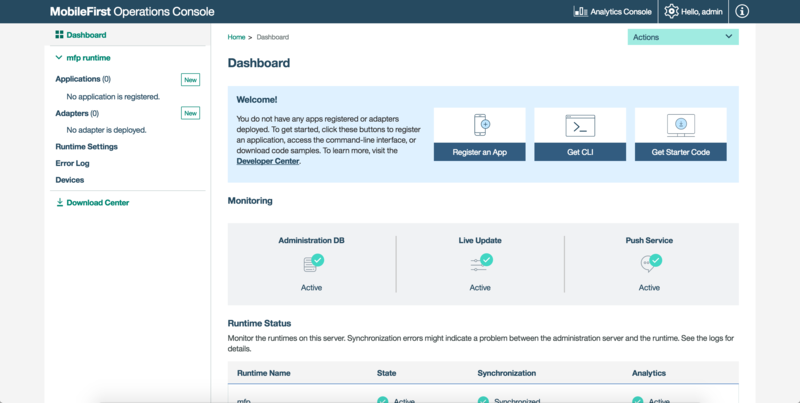 See all your deployed applications and adapters at a glance. See the Dashboard. Manage and configure registered applications, including Direct Update, remote disablement, and security parameters for application authenticity and user authentication. Set up push notification by deploying certificates, creating notification tags, and sending notification. Search for devices that access MobileFirst Server and manage their access rights. Adjust client logger configurations through log profiles. Track how product licenses are used. From your browser of choice, load the URL http://localhost:9080/mfpconsole. The username/password are admin/admin. From a Command-line window, with the MobileFirst CLI installed, run the command: mfpdev server console. From your browser of choice, load the URL http://the-server-host:server-port-number/mfpconsole. 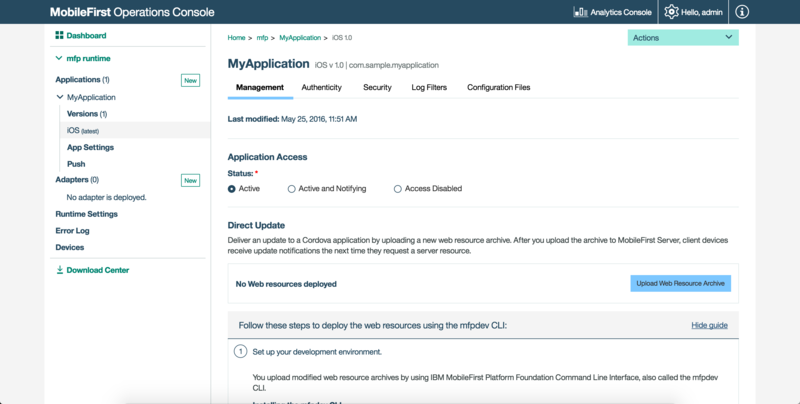 The host server can be either a customer-owned server, or the IBM Cloud service, IBM Mobile Foundation. Run the command: mfpdev server add and follow the on-screen instructions. Run the command: mfpdev server console MyRemoteServer. The Dashboard provides a glance view of the deployed projects. The dropdown provides quick access to various console actions. Edit runtime properties, global security variables, server keystore and confidential clients. The Error log shows a list of the failed management operations that were initiated from the MobileFirst Operations Console, or from the command line, on the current runtime environment. Use the log to see the effect of the failure on the servers. For more information, see the topic about error log of operations on runtime environments in the user documentation. Administrators can search for devices that access the MobileFirst Server and can manage access rights. Devices can be searched for using either user ID or using a friendly name. The user ID is the identifier that was used to log-in. A friendly name is a name that is associated with the device to distinguish it from other devices that share the user ID. For more information, see the topic about device access management in the user documentation. Provide basic application values and download Starter Code. Manage and configure registered applications by use of Direct Update, Remote Disable, Application Authenticity, and setting security parameters. 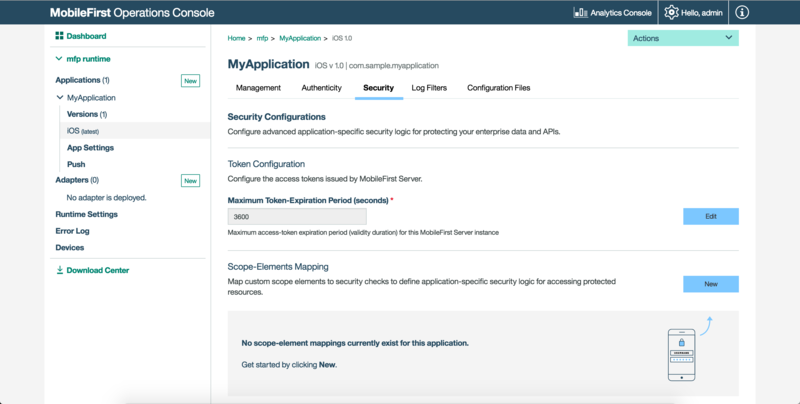 Configure application security parameters, such as the default token expiration value, map scope elements to security checks, define mandatory application scopes, and configure security-check options. Learn more about the MobileFirst security framework. 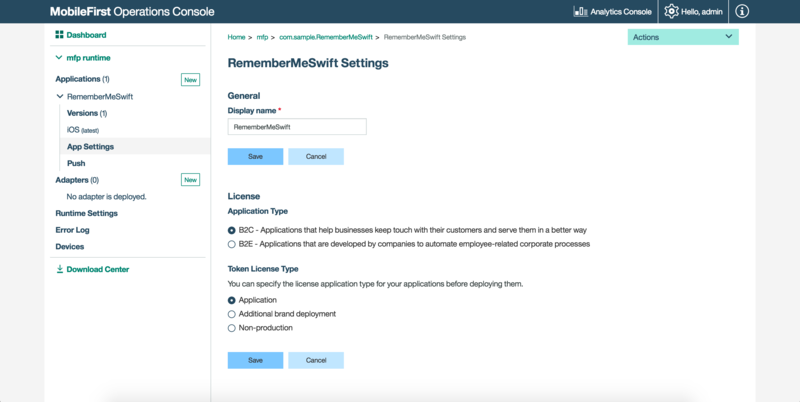 Configure the display name of the application in the console as well as the application type and licensing. 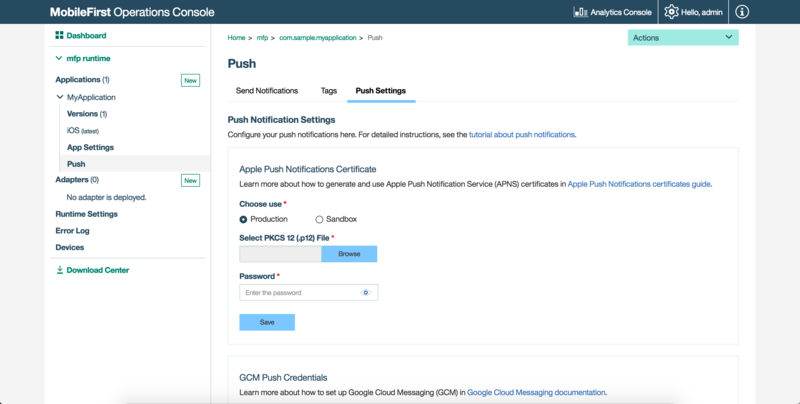 Set-up push notifications and related parameters, such as certificates and GCM details, define tags, as well as send notifications to devices. 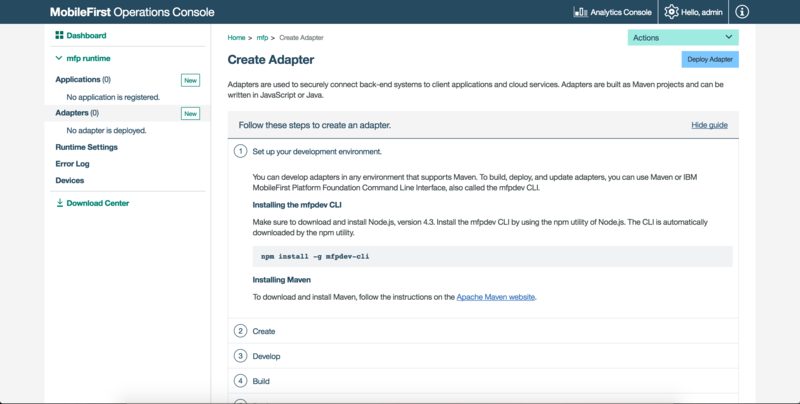 Register an adapter and download Starter Code, as well as update an adapter on-the-fly by updating its properties without needing to re-build and re-deploy the adapter artifact. After an adapter is deployed, it can be configured in the console. Administrators can use log profiles to adjust client logger configurations, such as log level and log package filters, for any combination of operating system, operating system version, application, application version, and device model. When an administrator creates a configuration profile, the log configuration is concatenated with responses API calls such as WLResourceRequest, and is applied automatically. For more information, see the topic about client-side log capture configuration in the user documentation. Accessible from the top Settings buttons. License terms vary depending on which edition (Enterprise or Consumer) of Mobile Foundation is being used. 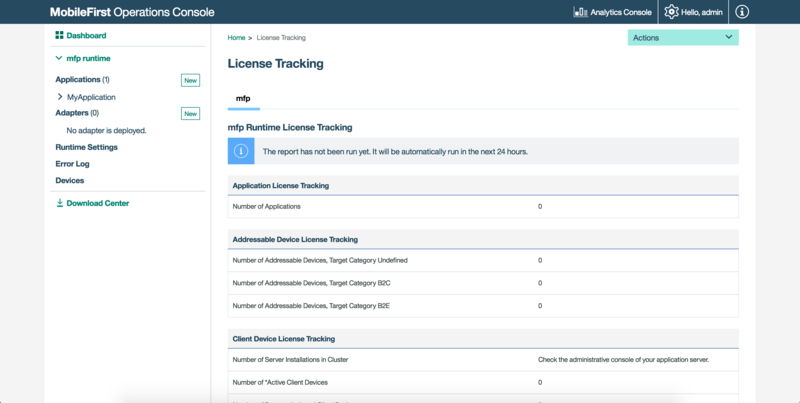 License tracking is enabled by default and tracks metrics relevant to the licensing policy, such as active client devices and installed applications. This information helps determine whether the current usage of Mobile Foundation is within the license entitlement levels and can prevent potential license violations. By tracking the usage of client devices and determining whether the devices are active, administrators can decommission devices that should no longer be accessing the service. This situation might arise if an employee has left the company, for example. For more information, see the topic about license tracking in the user documentation. 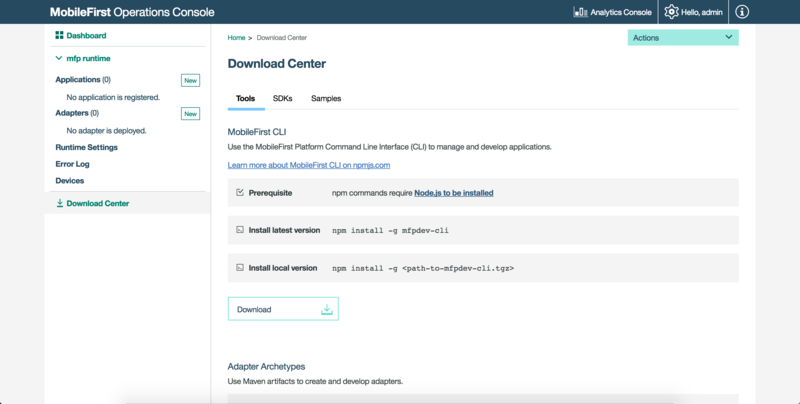 For situtations where Internet connectivity is not available, you can download a snapshot of the various development artifacts of Mobile Foundation from the Download Center in the MobileFirst Operations Console.